Unlike many of my fellow Daring Bakers, I cannot claim to have watched Julia Child’s cooking shows or even read any of her books until recently. I was more interested in Asian, Mexican, or Italian cooking, anyway. That’s what I told myself, but in truth it’s because I thought her cooking style was beyond my skill level. What I really needed was a push from someone who had more faith in my cooking skills than I did, and that push came last fall from one of my neighbors. She asked me to make Julia’s chocolate mousse for her sometime and even loaned her copy of The Way to Cook. How could I say no to that? So I tried it and found it wasn’t as hard as I thought. Or perhaps I’ve grown a little and now have an appreciation for everything Julia had to share. And how could I not appreciate a woman who started cooking in her 40s? It was quite inspiring to this self-taught home cook in her early 40s. So I tackled the mousse and then her amazing French onion soup, and both turned out well. So when Mary of The Sourdough and Sara of I Like to Cook announced that the February Daring Baker’s challenge would be Julia Child’s French bread, I was excited. Having spent the last few months learning to bake artisan breads certainly was a factor in my excitement. Something new to try! You must follow the recipe exactly as written. No sponges or poolishes allowed. 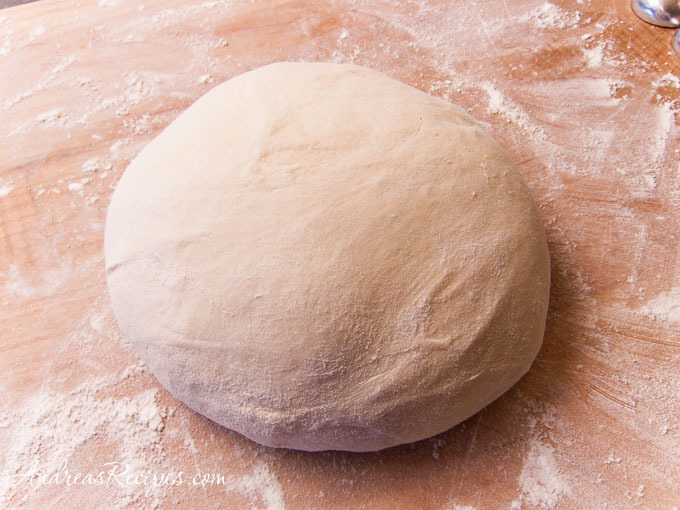 You may not add anything but flour, salt, yeast, and water to the dough. You must make at least one loaf of plain French bread. You must make the bread in “free form” fashion. No loaf pans, bannetons, brotforms or baguette pans may be used. I followed the rules and made one plain batard as well as a boule and an epi. The epi was a new loaf for me, and I followed the excellent directions for cutting the loaf provided by Kitchen Mage. I had planned to play around with some whole wheat versions this week but ran out of time. Tried to simulate a baker’s oven by using a baking stone and creating steam using ice in a preheated iron skillet. The recipe is long, but that’s because it’s a master recipe. Julia gives directions for mixing and kneading by hand, but since I use a stand mixer (carpal tunnel syndrome makes it hard for me to knead for more than a minute) I’ve given instructions for that method. I included other notes from our wonderful hosts Mary and Sara in italics. They also provided very detailed instructions complete with photos (12 pages worth! ), which you can find here. Don’t let all the detail deter you from trying this bread. The details are very useful for beginning bakers. Stand mixers vary widely in power and will respond differently to kneading the dough. Mine is an old KitchenAid 300 watt (cobalt blue) from the mid 90s, and it stresses out–actually starts dancing across the counter–if I try to knead on speeds higher than 2. Kneading at that speed worked fine for this bread. 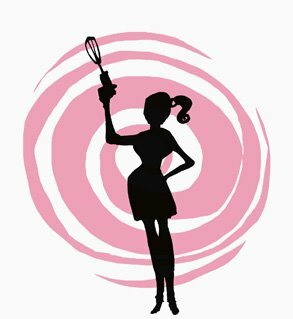 The Daring Bakers are legion…there are so many of us now it’s hard to keep track! To see many more beautiful loaves, visit The Daring Bakers Blogroll. Step 1. MIX THE DOUGH (le fraisage): In the bowl of the stand mixer, work all the ingredients together until the dry ingredients are all wet. Attach the bowl to the mixer base and work on low speed (2 on the KitchenAid) until a dough ball is formed, stopping the mixer and scrapping the bits of flour and chunks of dough off the bottom of the bowl and pressing them into the dough ball. Continue to mix the dough on a low speed until all the bits of flour and loose chunks of dough have formed a solid dough ball. If the dough is very dry, add a tablespoon of water at a time until the dough comes together. If the dough is very wet, add a tablespoon of flour at a time until the dough is soft and only slightly sticky. Turn dough out onto a lightly floured kneading surface, scraping bowl clean. Dough should be soft and slightly sticky. Let the dough rest for 2 to 3 minutes while you wash and dry the bowl and the dough hook. Step 2. KEADING (petrissage): Place dough back into the bowl and using the dough hook attachment at the recommended speed (low), knead the dough for about 5 to 7 minutes. At about the 5 minute mark, stop the mixer and push at the dough with your fingertips. If it springs back quickly, you have kneaded the dough enough. If it doesn’t spring back continue to knead, stopping the mixer and retesting every 2 minutes. If the dough sticks to your fingers, toss a sprinkling of flour onto the dough and continue to knead. The dough should be light and springy when it is ready. Mary also recommends finishing with about 1 to 2 minutes of hand kneading just to get a good feel for how the gluten is formed. Let dough rest for 3 to 4 minutes. Knead by hand for a minute. The surface should now look smooth; the dough will be less sticky but will still remain soft. It is now ready for its first rise. 3. FIRST RISE (pointage premiere temps): Put the dough into your lightly greased rising container/bowl and attach the lid or cover with plastic. Put in a warm place free of drafts, such as inside the microwave or in the oven with the light on. (Julia recommended putting the bowl/container into a large plastic bag or covering with plastic, and topping with a folded bath towel. Set on a wooden surface (marble or stone are too cold), or on a folded towel or pillow, and let rise free from drafts anyplace where the temperature is around 70 degrees F. If the room is too hot, set bowl in water and keep renewing water to maintain around 70 degrees F.) Dough should take at least 3 to 4 hours to rise to 10-1/2 cups, tripling in size, though if you used instant yeast rising time will be faster. If temperature is lower than 70 degrees F, it will simply take longer. If you don’t have an oven light, like Mary, you can turn the oven on to its lowest setting about 5 minutes before you begin your rise. Leave on for 1 to 5 minutes until the temperature is around 75- 80 degrees F. Turn off oven, when you open the door to put the dough in to rise, your oven will be around 70 degrees F. Another trick is to put your dough on top of your hot water heater. Place a folded towel on top of the hot water heater and let rise. Also a heating pad works well. Mary also has used those give away shower caps from hotels to cover her bowls and the bowl covers for the metal mixing bowls work well too. 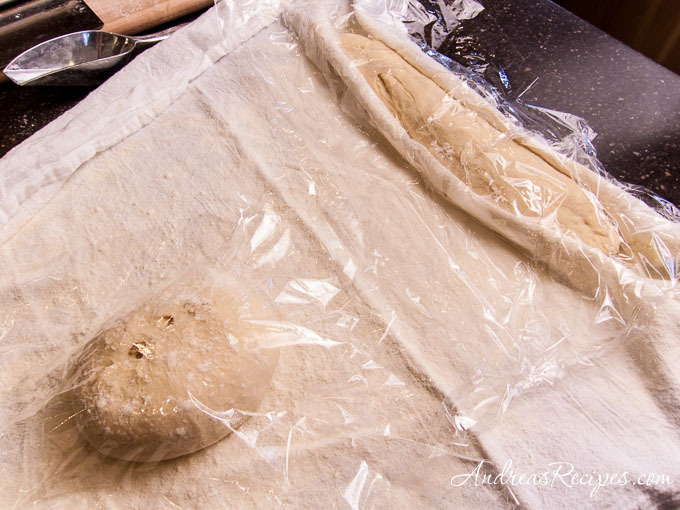 Always lightly grease the plastic wrap or bowl cover so if the risen dough touches it, the dough won’t stick. 4. DEFLATING AND SECOND RISE (rupture; pointage deuxieme temps): With a rubber spatula, dislodge dough from inside of bowl and turn out onto a lightly floured surface, scraping bowl clean. If dough seems damp and sweaty, sprinkle with a tablespoon of flour. Lightly flour the palms of your hands and flatten the dough firmly but not too roughly into a circle, deflating any gas bubbles by pinching them. Lift a corner of the near side and flip it down on the far side. Do the same with the left side, then the right side. Finally, lift the near side and tuck it just under the edge of the far side. The mass of dough will look like a rounded cushion. Slip the sides of your hands under the dough and return it to the bowl. Cover and let rise again, this time to not quite triple, but again until it is dome shaped and light and spongy when touched. You may need to lightly re-grease your bowl and plastic wrap for the second rise to prevent sticking. While the dough is resting, prepare the rising surface; smooth the canvas or linen towelling on a large tray or baking sheet, and rub flour thoroughly into the entire surface of the cloth to prevent the dough from sticking. 6. FORMING THE LOAVE (la tourne; la mise en forme des patons): Because French bread stands free in the oven and is not baked in a pan, it has to be formed in such a way that the tension of the coagulated gluten cloak on the surface will hold the dough in shape. Being sure that the working surface is always lightly floured so the dough will not stick and tear, which would break the lightly coagulated gluten cloak that is being formed, seal the edges of the dough together, your hands extended, thumbs out at right angles and touching. Roll the dough a quarter turn forward so the seal is on top. For Long Thin Loaves – Fincelles: Follow the steps above but making thinner sausage shapes about 1/2 inch in diameter. When they have risen, slash as with the Batard. 7. FINAL RISE (l’appret): The covered dough is now to rise until almost triple in volume (1-1/2 to 2-1/2 hours at around 70 degrees F). Look carefully at its pre-risen size so that you will be able to judge correctly. It will be light and swollen when risen, but will still feel a little springy when pressed. It is important that the final rise take place where it is dry; if your kitchen is damp, hot, and steamy, let the bread rise in another room or dough will stick to the canvas and you will have difficulty getting it off and onto another baking sheet. It will turn into bread in the oven whatever happens, but you will have an easier time and a better loaf if you aim for ideal conditions. Preheat oven to 450 degrees F about 30 minutes before estimated baking time. 8. UNMOLDING DOUGH ONTO BAKING SHEET (le demoulage): (Mary and Sara note: we are only going to describe the unmolding of The Batard but the unmolding process is the same no matter the shape of your loaf or loaves. The key to unmolding without deflating your bread is slow and gentle!) The 3 pieces of risen dough are now to be unmolded from the canvas and arranged upside down on the baking sheet. The reason for this reversal is that the present top of the dough has crusted over during its rise; the smooth, soft underside should be uppermost in the oven so that the dough can expand and allow the loaf its final puff of volume. For the unmolding you will need a non-sticking intermediate surface such as a stiff piece of cardboard or plywood sprinkled with cornmeal or pulverized pasta. 9. SLASHING DOUGH (la coupe): (Mary and Sara Note: We will only describe the slashing for the Batard here. All other slashes for the other shapes are described in Step 6: Forming the Loaves.) The top of each piece of dough is now to be slashed in several places. This opens the covering cloak of gluten and allows a bulge of dough underneath to swell up through the cuts during the first 10 minutes of baking, making decorative patterns in the crust. These are done with a blade that cuts almost horizontally into the dough to a depth of less than half an inch. Start the cut at the middle of the blade, drawing toward you in a swift clean sweep. This is not quite as easy as it sounds, and you will probably make ragged cuts at first; never mind, you will improve with practice. Use an ordinary razor blade and slide one side of it into a cork for safety; or buy a barbers straight razor at a cutlery store. 10. BAKING (about 25 minutes; oven preheated to 450 degrees F/230 degrees C): As soon as the dough has been slashed, moisten the surface either by painting with a soft brush dipped in cold water, or with a fine spray atomizer, and slide the baking sheet onto rack in upper third of preheated oven. Rapidly paint or spray dough with cold water after 3 minutes, again in 3 minutes, and a final time 3 minutes later. Moistening the dough at this point helps the crust to brown and allows the yeast action to continue in the dough a little longer. The bread should be done in about 25 minutes; the crust will be crisp, and the bread will make a hollow sound when thumped. 11. COOLING (2 to 3 hours): (Mary and Sara Note: We know this will be the hardest thing to do for this challenge. But, if you do not let the French bread cool, the bread will be doughy and the crust will be soft. 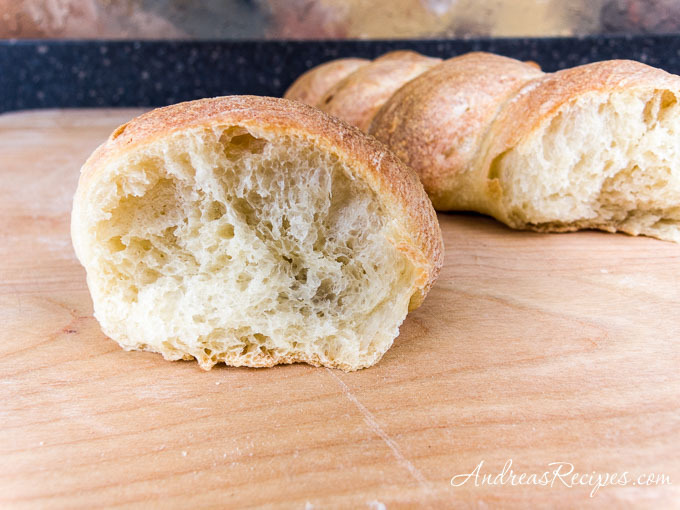 If you want to have warm French bread, re-heat the bread after it has cooled in a 400 degree oven, uncovered and directly on the oven rack for 10 – 12 minutes if it is unfrozen. If it has been frozen see the directions below.) Cool the bread on a rack or set it upright in a basket or large bowl so that air can circulate freely around each piece. Although bread is always exciting to eat fresh from the oven, it will have a much better taste when the inside is thoroughly cool and has composed itself. 12. STORING: Because it contains no fats or preservatives of any kind, French bread is at its best when eaten the day it is baked. 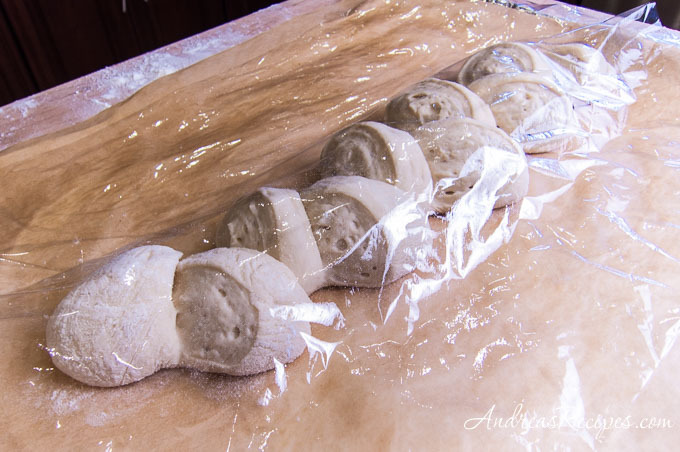 It will keep for a day or two longer, wrapped airtight and refrigerated, but it will keep best if you freeze it – let the loaves cool first, then wrap airtight. To thaw, unwrap and place on a baking sheet in a cold oven; heat the oven to 400 degrees. In about 20 minutes the crust will be hot and crisp, and the bread thawed. The French, of course, never heat French bread except possibly on Monday, the baker’s holiday, when the bread is a day old. 13. CANVAS CARE: After each bread session, if you have used canvas, brush it thoroughly to remove all traces of flour and hang it out to dry before putting away. Otherwise the canvas could become mouldy and ruin your next batch of dough. THE SIMULATED BAKER’S OVEN: Baking in the ordinary way, as described in the preceding recipe, produces an acceptable loaf of bread but does not nearly approach the glory you can achieve when you turn your home oven into a baker’s oven. Merely providing yourself with the proper amount of steam, if you can do nothing else, will vastly improve the crust, the color, the slash patterns, and the volume of your bread; steam is only a matter of plopping a heated brick or stone into a pan of water in the bottom of the oven. The second provision is a hot surface upon which the naked dough can bake; this gives that added push of volume that improves both the appearance and the slash patterns. When you have the hot baking surface, you will then also need a paddle or board upon which you can transfer dough from canvas to hot baking surface. For the complete set up here is you should have, and any building-supply store stocks these items. 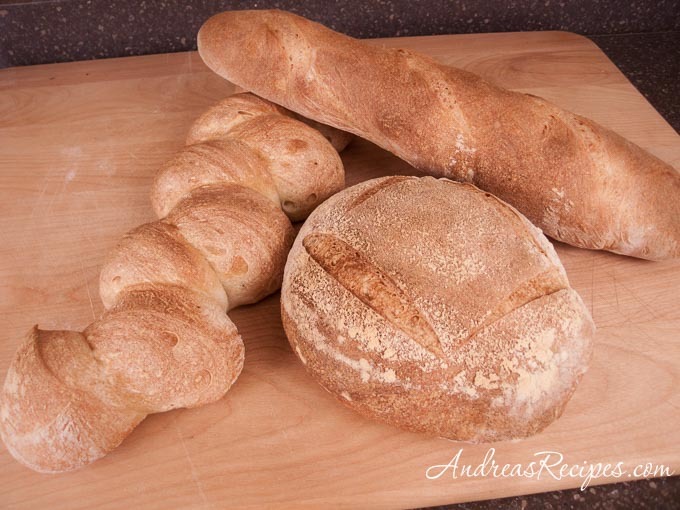 Andrea, these three loaves really look wonderful! Thank you so much for giving more detail on the epi. I am going to try that next time. OMG! Your loaves are beautiful and perfect. Great job, Andrea! I love the epi! It really is wonderful bread and your loaves are wonderful. I love kneading but not with carpal tunnel, thank goodness for the KA!! Your loaves turned out great looking! I love that you added some extra tips in the post! Your loaves look great! I especially like the epi! Wonderful! I like the squiggly one, too! Its interesting looking at before and after squiggly and seeing the change. All your loaves look yummy! Now you got us all drooling here, french bread is definitely my favorite one, with butter hummmmmmmm and a cup of coffee, and you described all the details… so I guess I can give it a try. The shapes are great! These look so goooood Andrea. I especially like the wiggly one. With all the bread you have been making I am sure your neighbors are wondering if a bakery has taken over. Great job! Your bread looks fabulous! You were in the BreadChick chat right? It was so fun being in the chat with you… Great job! Excellent job! I love the variety of shapes. I usually have trouble kneading for the same reason, but recently have given it a go and have been surprised to find that I’ve done just fine. Go figure! Of course, this dough was very, very soft. Your web site is looking spectacular, by the way…Cheers! Gorgeous! I love the different varieties! I never watch Julia either, but since learning about her I find her to be such an inspiration. Your bread looks great! I didn’t grow up watching Julia Child – and this was my first Julia Child recipe! Your bread looks wonderful! Look at that silky dough! I love the epi pic before baking, lovely holes, a dough full of life. I love what you do with your pictures, and I’m glad you’re discovering Julia Child! Your loaves look wonderful! I love the different shapes you gave them… Well Done! Isn’t it amazing what we can do when someone bodytackles us into it? great looking loaves! you shaped them so well! Okay so I heard a rumor that you made another loaf of bread besides the epi? heheee I can’t stop looking at it.. it’s fabulous! Excellent job my friend! (on both!) heee! I’m jealous. You made a Epi. Lovely loaves Andrea! I looove the epi! those are about the most perfect looking loaves i’ve seen so far! great job! Andrea, you epi is absolutely perfect! All your breadbaking of late paid off in this recipe. Great job and thanks for baking with Sara and I this month! Of your creation, my favorite is the pleated one. Looks beautiful and I’m sure it was yummy too! They all look wonderful Andrea, I think I have to try the cut one! How cool that you made an epi! You did a wonderful job on your loaves. They look simply delicious. A mixer – oh the envy! Hope everyone in the house got to chose their favorite bread shape and dig in – they look wonderful. I like your crazy wavy loaf! So fun! Like you, I have only recently become a Julia fan, because I had been under the mistaken impression that what she taught was way beyond me. Now that I have started paying closer attention I find that she wanted nothing more than to make good cooking and baking accessible to all. I just love her humor, pragmatism, and down-to-earth style. Your bread looks fantastic! Looks like we had the same idea for the shapes. Epis are still my biggest battle, every other one turns to my liking! Great job! You did a beautiful job with your bread! Just Beautiful! You are such a talented cook and I have to say that your blog is one of the places I go to when I need inspiration. I think Julia is such an inspiration for so many of us. French cooking intimidates me anyways and Julia always felt like she could be one of us, throwing something together in the kitchen. . . Your shapes are fantastic! Thanks for joining us this month. Your shapes turned out fabulous! Well done. I love teh wavy loaf! Can’t stop looking at it. My gosh its simply awesome!! I can’t stop staring at your wavy loaf! Its just too cute! I had fun chatting with you too Andrea! 🙂 I’m happy I discovered your beautiful blog this way! I’m SO impressed with all the shapes you made, especially the wavy loaf. I think I would have let my Kitchen Aid knead the dough if I weren’t so afraid of yeast. Thanks for stopping by, I know it’s hard to visit everyone’s when we’re 8,000. All came out great, kudos! Awesome looking loaves! Now I’ve another shape to try making…. Your breads look so good! I think you did a great job, whether you knew of Julia or not! Nice work! Brilliant Andrea, but then I would expect nothing less. Your loaves all look so professional. I made mine but have not yet posted. I have some serious catching up to do. Thanks for all the extra tips and a great article on artisan bread making. I too, have bread envy. Although I make all the time, I want my own bakery with a choice every day. The only thing about baking at home is that one loaf a day is the limit otherwise it doesn’t get eaten. Those loaves look fantastic Andrea! Way to go on the challenge! I’m glad you dared to try this! Hope you get a chance to see some of Julia’s shows. I have fallen in love with the look of the epi! Never heard of it and obviously didn’t pay much attention to it during my reading. You did a fantastic job! I’d hate to admit it, by I’ve never even heard of Julia Child before this! Great job on the bread, it looks gorgeous!! I love the epi shape. Gosh you make me feel so inadequate. What fabulous loaves you have turned out.